18th October 2017, New Delhi: For decades, Diwali has been synonymous with sweets and firecrackers. This Diwali will be a little different. There will be sweets but no firecrackers. The Supreme Court recently banned the sale of firecrackers in Delhi/NCR to combat the rising levels of air pollution in the city. LocalCircles conducted a set of polls in Delhi and NCR region to understand how citizens feel about this decision and not being able to burn firecrackers. Surprisingly, in the first poll 87% citizens in response said that they will not burn firecrackers this Diwali. 31% out of these citizens said that they would like to burn crackers but will not do it since they are not available in the market. 5% said that they have already got the crackers and will burn them, whereas 8% said that they would like to burn crackers and know how to get them in spite of the ban being imposed. More than 4600 citizens voted on this poll. Delhi is one of the most polluted cities in the world with air pollution levels in the NCR region usually being five times the safe levels prescribed by WHO but during Diwali, it goes up to 10 times due to excessive use of firecrackers combined with the burning of crop residue in Punjab and Haryana. 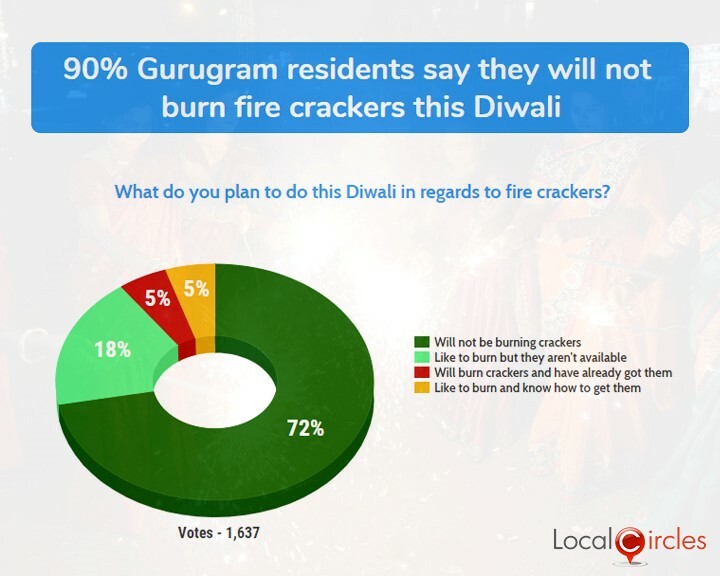 The second poll was conducted in Gurgaon where 72% said they will not be burning crackers this Diwali, 18% said they would like to burn but won’t burn since they are not available, 5% said they will definitely burn crackers and have already got them and another 5% said they will like to burn crackers and know where to get them from. 1,637 Gurgaon residents voted on this poll. The decision comes after the region of Delhi/NCR suffered from very high pollution levels last year after Diwali, leading to people resorting to wearing breathing masks to shield themselves from falling sick. PM2.5 levels had touched 624 micrograms per cubic meter, i.e. ten times the safe standard, on the day following Diwali. The third poll was conducted in Noida where 80% citizens said they don’t want to burn crackers while 10% said they will not burn crackers as they are not available in the market. 5% said they have already got the crackers and 5% said they know how to get them and will definitely burn them. 1,642 Noida residents voted on this poll. 90% Noida residents say they will not burn fire crackers this Diwali. The fourth poll was conducted in Faridabad in which 1,065 residents voted. 78% of these said they don’t want to burn crackers this Diwali while 11% said they will not burn crackers due to non-availability. 11% said they have already got crackers and will definitely burn them. The fifth poll was conducted in Ghaziabad which had 1,071 participants. 67% of these said that they don’t want to burn crackers this Diwali while 17% said they will not burn due to lack of availability. 11% said they already have crackers and would burn them on Diwali. The effects of this decision are yet to be seen but many citizens have pointed that people have found backdoor channels to procure firecrackers. The majority feel that banning firecrackers is a good move and would lead the way in the fight against pollution.